Menswear enthusiasts will soon begin wearing textured and warmer fabrics to brace themselves for the upcoming weather changes. With this comes a new rotation of jackets, pants, and accessories. A must have for any man is a quality wool, check suit. This black and gray jacket and pant from H&M are an affordable option. 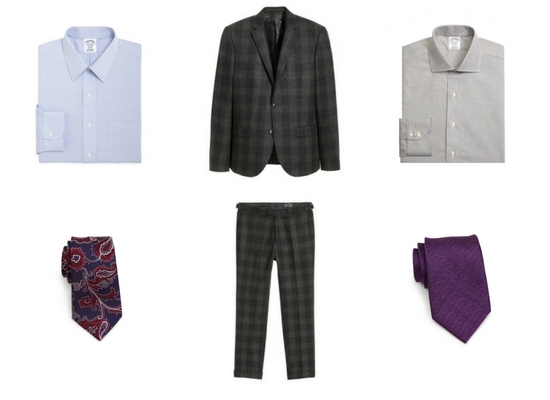 While the suit has a pattern that doesn’t mean you can’t mix other designs into the outfit. We’ve chosen a bold paisley tie in wine red and purple with a solid blue shirt or a gray dress shirt and herringbone wineberry necktie. In both looks, the pop of color will catch your eye in the best way possible.